The power of MyYearbookBuilder in the palm of your hand! Today, we are witnessing a mobile revolution in which the handheld device is quickly becoming the primary access point to the Internet. The convergence of faster, ubiquitous wireless networks with more sophisticated mobile devices is enabling access to information at anytime, and in virtually any location. Our users can immediately access MyYearbookBuilder.com from any web-enabled mobile device. Upload photographs, send signature requests and preview your school’s yearbook as it is being built online, all in the palm of your hand. 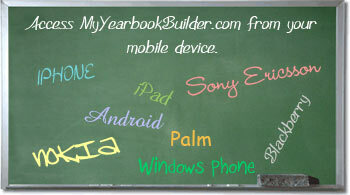 MyYearbookBuilderMobile runs on all handheld devices and smart phones having mobile web access. In the spirit of applications, students can also download rich, interactive mobile apps designed for specific devices like iPhone, Droid and BlackBerry.